Read reviews of Vogel Home Improvement and testimonials from clients who have hired Bob as their remodeling contractor for home remodeling services in the Anchorage area. "Are you tired of looking up and seeing that old cottage cheese texture on your ceilings? I was. That's how I came to know and respect Bob Vogel. Bob ended up remodeling my whole condo. From the kitchen and bathrooms and all the tile work & plumbing that entails, drywall and electrical work to wood flooring and my outside decks. He did a great job for me as he will for you. I recommend him if you're planning a remodel of your place. He cares about quality. Sincerely, John Haniszewski"
"I have no pictures of Bob's work but I can provide this note; He takes pride in his work and takes care to insure his work is done to your complete satisfaction. He is excellent in doing any type of work, from electrical, plumbing, you name it. I would not hesitate in recommending his work to anyone!" "I was very happy with the work Bob did for me. He replaced my deck, remodeled my half-bath room, and added safety features to our home. His work is meticulous, on-time and under the estimated budget. I appreciated his suggestions and his keeping disruptions to a minimum. Others have complemented the work he has done here. What more could you ask for?" 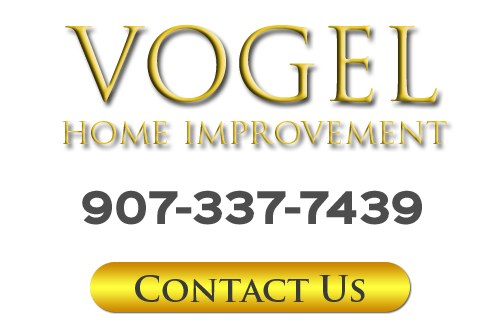 "When anyone asks me to recommend to them someone for a home improvement project I always tell them about Bob Vogel. He did an excellent job for us replacing our carpet with laminate flooring. He also fixed our sub flooring in our bathroom after it was damaged and placed down new vinyl flooring. We knew we could trust him for he had replaced our close friends carpet with laminate flooring and remolded their bathroom. So, we felt very comfortable leaving him alone in our home while he worked on our project. He also remodeled our neighbor's kitchen and bathroom. The finished project showed excellent craftsmanship and attention to detail." For more reviews of your Anchorage remodeling contractor, Vogel Home Improvement, please call 907-337-7439 or complete my online request form.